In the post war period up to the late 1950s the airborne threat was still perceived to be mainly from heavy bombers at medium altitude as it had been during WW2. However, during this period the RAF and other air forces were moving towards the use of attack fighters capable of flying at low levels below the radar cover and only becoming detectable at short ranges. This complicated the threat scenario and anti-aircraft missile defence systems had to try to encompass short range low altitude threats, requiring a rapid reaction, as well the medium altitude longer range threats. The existing anti-aircraft missile systems were large, not very agile and very expensive. The cost of such systems was an important factor in determining the number of fire units that would be deployed to defend a Ground Asset. Their performance against low level attack aircraft was not known and manufacturers’ claims for the effectiveness for new systems under development were difficult to validate. 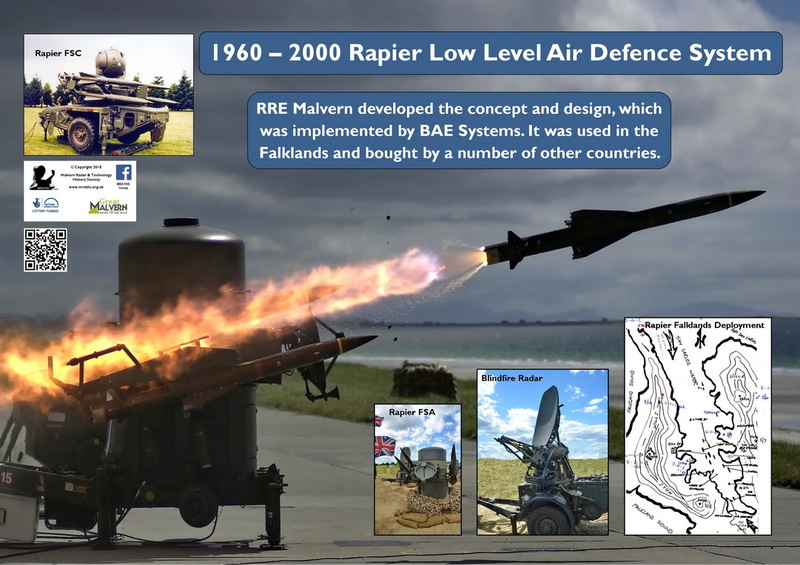 It was in this context that RRE made a crucial contribution by proposing a radical system design which would provide the UK with a cost-effective design for a low level air defence system. Within the Royal Radar Establishment (RRE) Guided Weapons(GW) & Space Research Department, the Short Range GW and GW Control Systems Division was setup in 1957 headed by John E Twinn with two supporting scientists Colin Baron(1921-1987) and IAD Lewis. The Division also had two Army officers of Major rank and two RAF Officers. Its brief was to perform an Operational Assessment of the performance requirements and an assessment of different Guided Weapon systems. Initial assessment was conducted for the Bloodhound and Thunderbird medium altitude systems. At this time RRE had to advise the Army on the requirements for PT428-a new UK low level air defence system. In those days there was virtually no operational analysis carried out for low level air defence. RRE had just installed its first mainframe computer and computer modelling was not then readily feasible. Thus, there was little hard data available with which to evaluate the probability of successful engagements in different threat and deployment scenarios for the new systems. The new competing low level defence systems at that time were the English Electric PT428 and the US MIM-46 Mauler systems. The RRE Division modelled critical aspects of system performance and built physical models to test various aspects of performance of the missile and ground systems. RRE set up a study to determine the optimum design criteria for the Defence of Malvern. This study was crucial in that it looked at strategic locations where it would be possible to site two fire units to defend the town in accordance with current thinking. The study showed that it would not be possible to defend from just two fire unit locations. An attack aircraft could always find a way to fly between the fire units. The use of Military staff greatly helped the scientists to understand operational deployment issues. The realisation that two fire units were not enough drove them to examine how to provide more fire units of a less expensive design to achieve the same objective. The chosen missile guidance system was based on Command to Line of Sight(CLOS) since it was considered to be less complicated and less costly both in terms of the missile and the ground equipment. RRE chose optical tracking of the target and the missile, thus committing to a daylight and fair weather only system. There were great cost savings in doing that. However, it had been envisaged that Radar tracking could be added to give day and night capability. The missile had to be supersonic to keep down the engagement time. The missile tracking had to be automatic and aligned with the target tracker since an operator’s reaction would be too slow. Initially the RRE team envisaged the use of TV for both target and missile tracking. In the event BAC had more experience and so the BAC solution was adopted for an optical target tracker and TV missile tracker. Air mobility was considered very important at that time, so the RRE design of the launcher on a 2-wheel trailer was able to be readily deployed by helicopter and bore a remarkable resemblance to the eventual Rapier design. Radar false alarms were an important consideration so the RRE team required an IFF (identification friend or foe) subsystem to be integrated and operated automatically, avoiding the need for operators looking at screens. Terrain screening between Fire Units was a significant element in the envisaged system deployments. Resulting in a low cost easily transported system that would have good performance against low level attack aircraft out to a range of 6 km and medium level aircraft out to 10km. The concept was rejected by the MOD and Army, who had already decided to buy the US Mauler system as the English Electric PT428 system was cancelled in Feb 1962. Mr Twinn, in his published document , reported that to stifle any opposition from RRE, instructions were issued that RRE was not to talk to Industry and instead should concentrate on long term studies. The RRE team would not give in and took risks and put their careers on the line to pursue their proposals. It was later in June 1962 that Mr J W Twinn, by chance, met a senior Army General, who had previously been against the RRE System concept and persuaded him to become interested. In July 1962 five Army Generals came to Malvern to be given the full story and they turned from rejection to acceptance. The Army then formally asked RRE for more information on the RRE System proposal. In October 1962 the MOD agreed for a Study Contract to be placed with BAC known as ET- 316 with RRE Malvern as the Technical Authority. This ended the MOD embargo on RRE talking to Industry. This was extremely fortunate as the Mauler system hit some major problems in 1963 and was cancelled in 1965 leaving the UK and US armies without a low level air defence system. The Army and RAF then had to rely on the old towed Bofors guns similar to those used in WW2. The Malvern scientists were eventually pleased that the RRE system concept was successfully adopted by BAC, with very little change from their original concept. BAC produced an initial system called ‘Sightfire’ and an MOD development contract was placed in 1964 with RRE carrying out the pivotal role as Technical Authority. The name Rapier was adopted by BAC in 1966. The pivotal role of RRE scientists in the system design for Rapier was subsequently lost as BAC/BAe have not referred to the RRE System design but only to its ‘Sightfire’ implementation as the Rapier origin. The Rapier system was a missile launcher system mounted on a 2-wheel trailer that could be towed with a Land Rover and easily deployed by helicopter. It was almost unchanged in any major respect from the system concept proposed by RRE. The trailer carried the missile launch rails for 4 missiles and on top was mounted a surveillance/Alarm radar, within a cylindrical enclosure, for target detection and laying on the optical tracker to the target. It also carried the J Band radar for gathering the missile and laying it on to the Tracker TV sensor. The Optical Tracker was separate from the fire unit and mounted on a tripod. This was to have dual channel for target tracking and missile tracking and the optical part was subcontracted to Barr & Stroud. Also attached to the launcher trailer was a dismountable generator to power the system which was rather noisy for covert operation. Rapier Performance in the Falklands War. At RSRE Malvern, Hugh Williams and others supported the Army by working out optimum siting locations for Rapier systems for the defence of ground targets. The Rapier system design should have been well suited for deployment in the Falklands. However, in this first real operational test of Rapier, radar interference problems with Royal Navy ships and other Rapier fire units showed up, either because they were not anticipated during industrial development of the system or because the Army system setup was not right. In any case, the Senior Service dictated that the Army’s Rapier radars could not be used so Rapier operators had to do the best they could to acquire targets with just the Optical tracker and that greatly extended the reaction time. This often meant that the target was flying away by the time the Rapier tracker acquired it and the missile range was sometimes exceeded. The Argentinians also liked to attack in low visibility conditions and this affected Rapier operators due to the high loss in the Optical Tracker, which had virtually no optical coatings on its long train of optics. The operators had difficulty in seeing the targets against the tracker cross wires. Rapier FSB1: Towed Rapier was upgraded to Field Standard B1(FSB1) about 1981 but it was not judged ready to be used in the Falklands war in 1982. FSB1 included a Tracker Radar known as the DN 181 produced by Marconi. 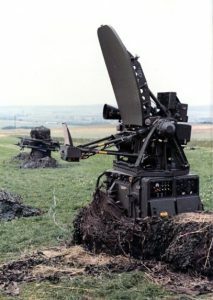 The DN181 was mounted on a separate 2-wheel trailer and the Rapier system gave the operator a choice of either manually using the Optical Tracker or this automatic Blind Fire capability. Rapier FSB2: Towed Rapier FSB2 (also known as Rapier 80). This included upgrades to various subsystems including the Alarm radar; it carried 6 missiles. FSB2 (EO) – This version of towed Rapier was also known as Rapier 90: The upgrade involved the replacement of the tripod mounted Optical Tracker with a 2-wheel trailer- mounted Electro-Optic (EO) Tracker. This tracker incorporated an upgraded Charge Coupled Device(CCD) TV missile tracker and an infrared (IR) target tracker using a very successful Thermal Imaging Common Modules (TICM) sensor, which had been developed by the RSRE IR Sensor Research & Development team. This Tracker relied on compressed pure air for cooling the IR Sensor detector with its attendant gas bottle logistics issues. 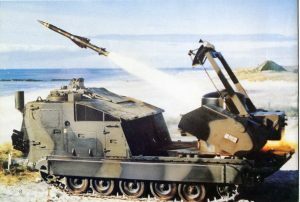 Rapier FSC: Rapier field standard C (also known as Rapier 2000 or JERNAS for the export market) was developed from 1990 by Matra BAe Dynamics (MBDA) and is in service with the Royal Artillery. The overall system includes a Dagger surveillance radar and a Blindfire tracker radar. This system was significantly different from previous Field Standards but the EO Tracker was based on that for FSB2-EO system. The IR Sensor used a miniature cooling engine for cooling the IR Detector, thus avoiding the need for gas bottles. The launcher carried 8 missiles and was mounted on a large and much heavier trailer. In this respect the FSC system departed from the original RRE design principles. The guidance of the missile is automatic with infra-red and radar command to line of sight. Approximately 25,000 missiles were built up to the millennium. The original RRE concept was for a ’hittile’ which minimised the size and complexity and cost of the missile and the ground system. The RRE concept of Command to Line Of Sight (CLOS) enabled good accuracy for the missile to hit aircraft targets. The supersonic missiles used solid fuel and were quite compact. Upon launch the missile had to be gathered and brought to line of sight of the Missile TV tracker. A radar operating in (J Band) performed this function. 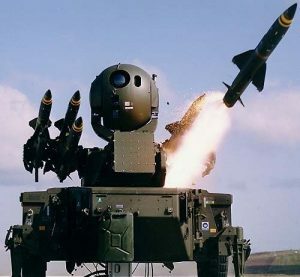 To engage smaller targets like drones a Rapier missile(Mk2B) with a proximity fuse was added and FSC could launch both types of missile. The missile launcher has rails for 8 missiles. The RRE GW team, back in 1962, had the idea of producing a tracked semi-armoured version of the missile system for use near the battle area. However, that would have had to wait much longer for implementation, but for a chance political event that made it possible. Iran ordered a tracked version of Rapier but the order was not completed when the Shah of Iran was toppled from power in 1979 by the Islamic revolution. Consequently, there was an opportunity for the MOD to purchase these systems for the British Army in the early 1980s. The tracked Rapier systems were mounted on a US M548 tracked carrier. The fire units on Tracked Rapier Mark 1A were upgraded to the same standard as FSB 1 in the towed version for UK systems. Tracked Rapier was further enhanced about 1985 to Mark 1B. 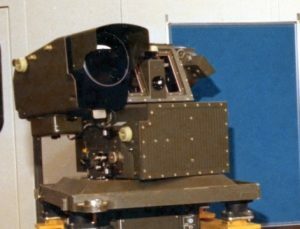 This version included a night time/poor visibility capability when a TICM 2 based thermal imager was added to the Optical tracker again developed by Malvern. The tracker was then designated ‘Tracker Optical Thermally Enhanced (TOTE)’. 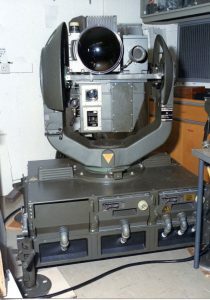 This was the first Rapier system to have a Tracker with a thermal imager for operating in low light, poor visibility and night time operations. Despite its early problems, Rapier went on to be very successful and was sold to several countries. About 600 launchers and 350 tracker radars were manufactured.